VOTING HAS CLOSED FOR THIS ROUND. CHECK OUT THE ROUND OF 8 HERE. 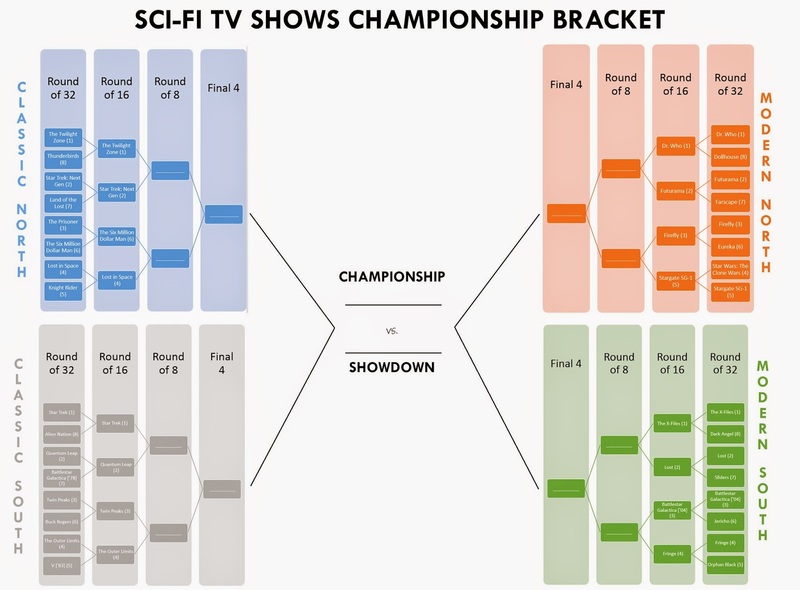 The NCAA Tournament is about to resume for the Final Four games, and the results are in for Round 1 of the Nerds of a Feather Greatest Sci-Fi TV Show of All Time Bracketology Extravaganza™. If you missed the first post, the tl/dr version is I made a list of 32 contemporary and classic sci-fi shows, and completely unscientifically lumped them into regions and seedings. Then, a lot of votes came in! The top vote-getter of all entries was Star Trek: The Next Generation, followed by Firefly. Number Two seed Lost faced an unexpectedly tough challenge from Seven-Seeded Sliders, but most of the closest races were in the (4) vs (5) matchups. So what's going to happen in the Round of 16? Will Star Trek: The Next Generation continue steamrolling the competition, even when the competition is The Twilight Zone? Can the speculative fiction Twin Peaks make a deep run in this sci-fi bracket where some say it doesn't belong? Can a battered Lost rally and challenge The X-Files? I sure don't know, but it's up to you guys. Vote below!